There are multiple ways to check a member in, however the most convenient method is to use the I1 laser barcode scanner. Simply have the member scan their barcode and they will be instantly checked in. 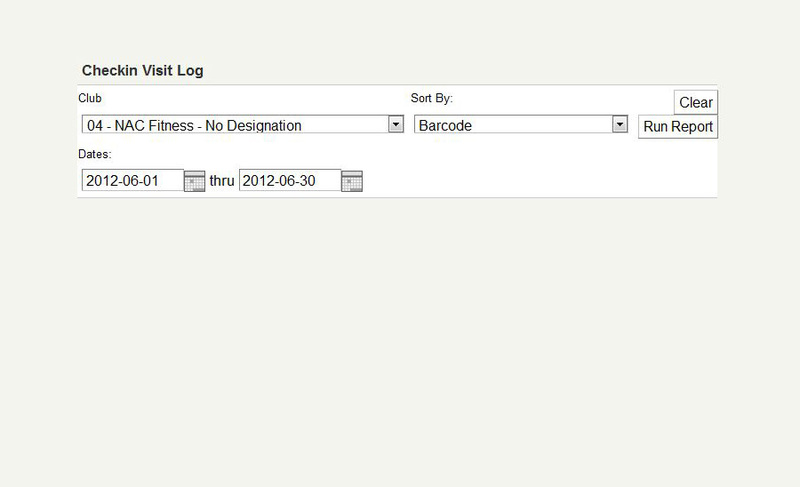 Alternatively, you can search by last name or manually key in a barcode number on the input field. InfinitiONE has a robust information center and will advise you of all the important details about a members account status. In most scenarios, members will check in and receive a pleasant audible tone letting staff know that the members account is in good standing. If the member has any submembers attached to their account, or if a submember of the primary member checks in, the system will indicate their submember status on the screen. If the member is not in the system, or if the barcode is invalid, the system will indicate that there is no member in the system under that barcode number. The software will also describe the exact reasons for flagging the bacrode as invalid. For example, an expired credit card number on file, or outstanding unpaid membership dues. Whenever a barcode number is flagged as invalid, an auditory buzz tone will alert front desk staff to an issue. 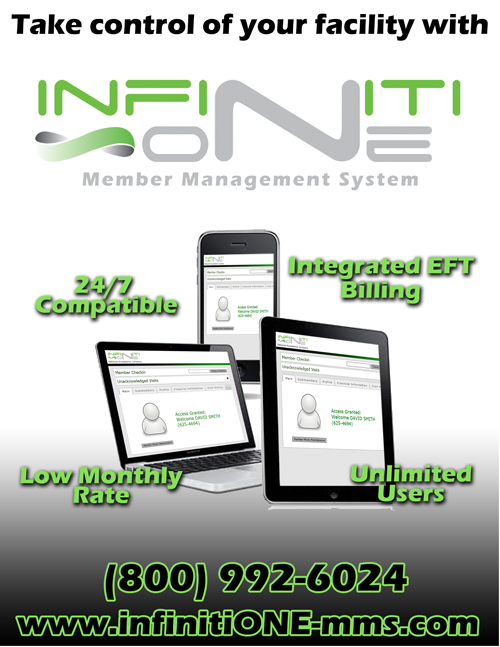 One of the key elements of the InfinitiONE member check-in system is the financial tab, which gives a concise breakdown of the members account. In the event that a credit card has expired or is expiring soon, the system will highlight the relevant fields. 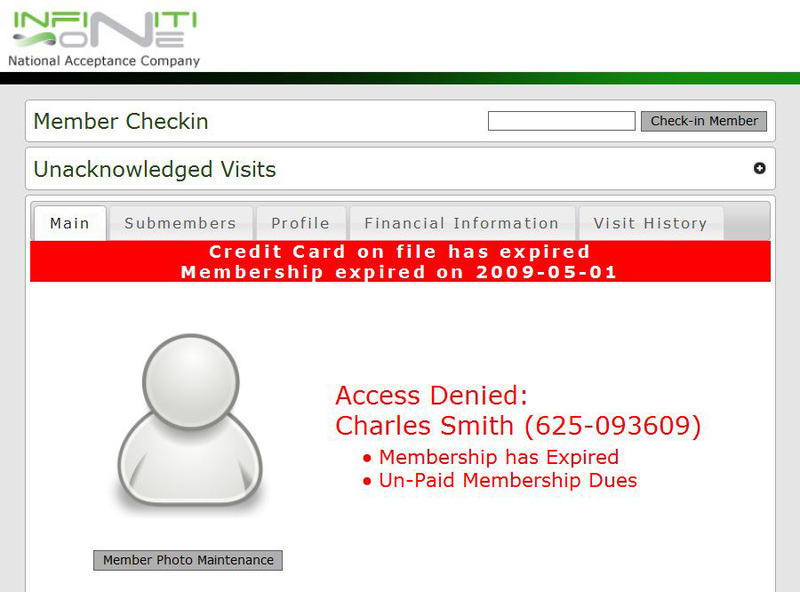 Photos are a key aspect of any membership check-in software, and allow for staff to visually confirm that the person scanning in is actually the person attached to the account. I1 allows for easy photo upload and management via webcam hardware and Adobe Flash®. Adding submembers to an account is accomplished via the Create New Barcode interface. Simply specify the primary members contract number, and enter the barcode number and submember name to attach a new submember to the primary members account. Managing existing submember is accomplished with ease. Under barcode management, search for a member by name, barcode, or contract. A list of results will appear. 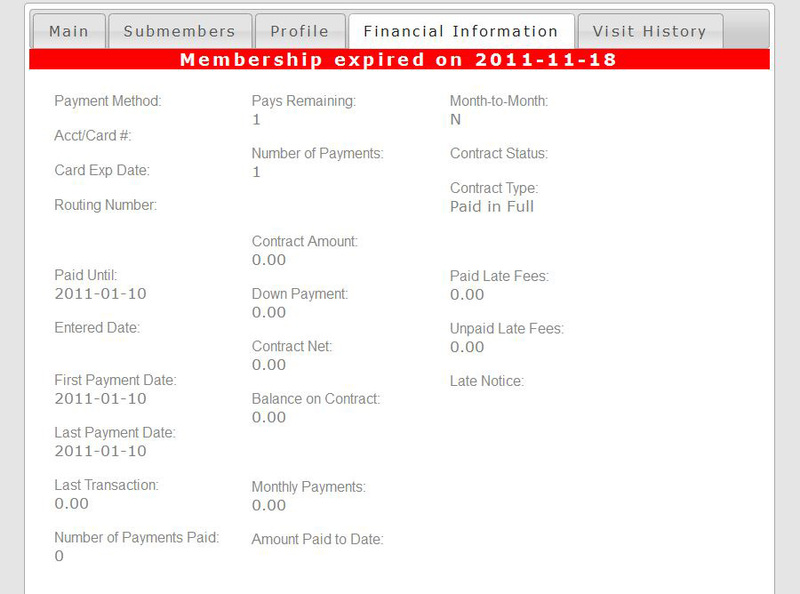 From this screen you can re-take a photo, or disable a member/submember account without affecting the primary billing account. Countdown Accounts are a handy tool for clubs offering ala-carte or trial services without the need to generate a complete billing contract. many clubs use the countdown accounts tool to sell tanning sessions or run a trial membership with limited uses. By creating a countdown account and specifying the number of uses, each time a member swipes in, a visit is deducted from their barcode account. When the account reaches zero, access is denied, and the front-desk representative can then upsell the member into a full contract, or reissue more sessions on the barcode. 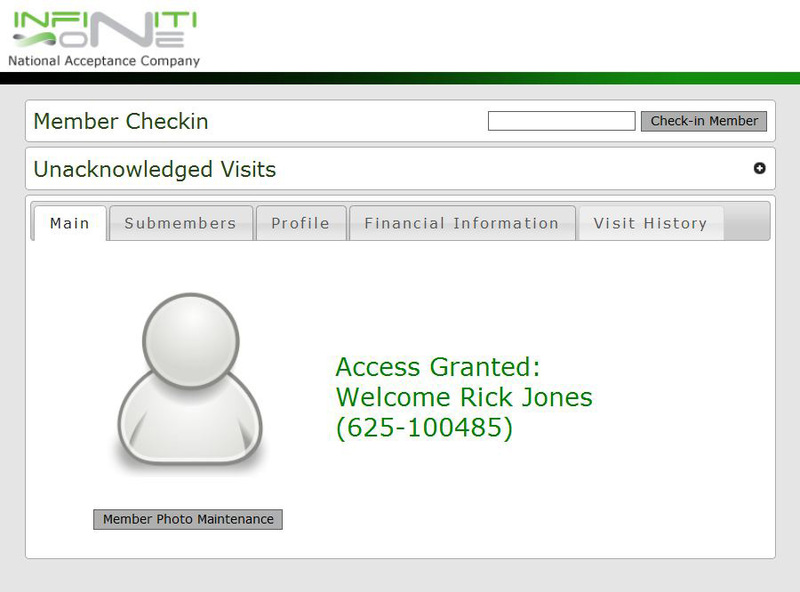 An important aspect of any member tracking system is the ability to generate reports on what members have checked in. 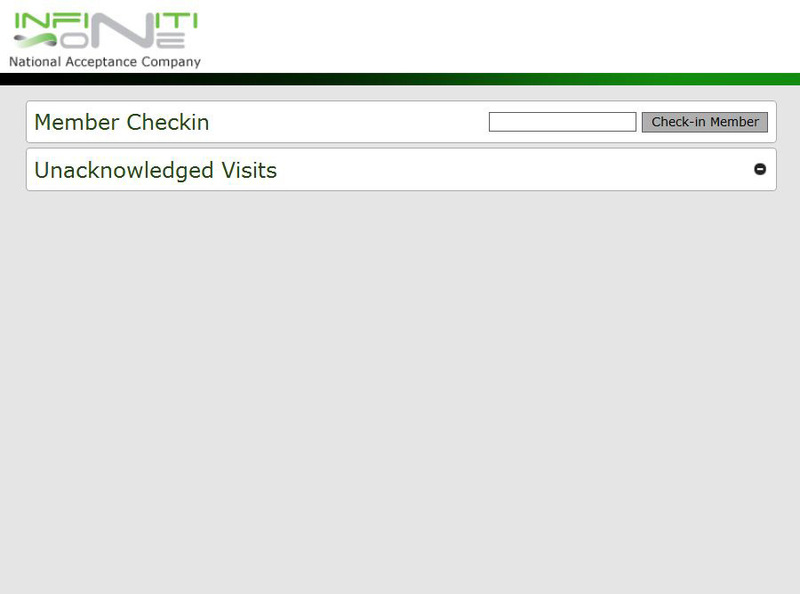 The Check-in Visit Log will generate a report with any given date range and offers a number of ways to organize the report results. The report will show successful member check-ins (access granted), unsuccessful member check-ins (no member found, or member denied at the front-desk), and unacknowledged visits (members that were denied but have not been addressed by a front-desk representative). The unacknowledged visits are common for 24/7 gyms where staff may not be on hand at all hours to address member account issues.